There was a lot of hububb when the well-known David Chang brought his highly-regarded Momofuku from New York to DC. Momofuku CCDC, along with it’s bakery Milk Bar, attracted lines with hours-long waits for its renowned pork buns, ramen, and crack pie. Somewhat to my own surprise, I resist the hordes, telling myself I’ll wait until things settle down. Months pass and I continue to procrastinate. When I’m asked to suggest restaurants for an outing with friends who are like-minded food adventurists/bloggers, I have an aha moment which leads us to Momofuku CCDC. Let the over-ordering commence! A bowl of spicy cucumbers doesn’t seem likely to set the world on fire. 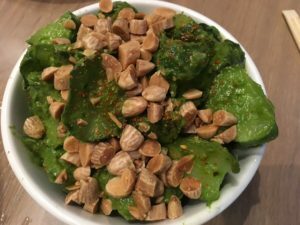 But the thickly cut cukes generously tossed with scallions, Togarashi spice, and almonds offer up a lingering pop of flavor. Who knew that cucumbers could be so scintillating! 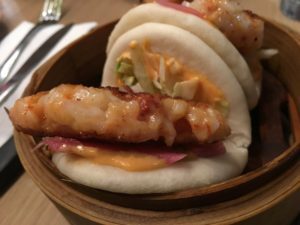 David Chang’s supple buns are notorious. There’s a set that encases shrimp with a slathering of zesty mayo and just a touch of cool slaw. Delightful. 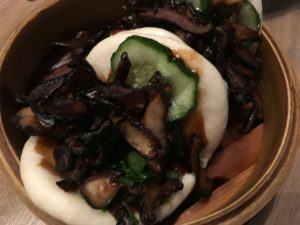 Another incorporates crisp and meaty shiitake mushrooms dressed with hoisin sauce, cucumbers, and scallions. Another winner. 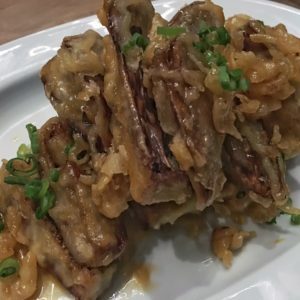 I don’t expect to be bowled over by strips of fried eggplant. But this dish jolts my taste buds, with just the right balance of spicy and sweet and a crunch that makes my heart beat faster. My dining companions can’t stop raving about ramp noodles. I’m too busy fawning over eggplant, so I mostly miss out on the love fest. Our post-dinner activity is a flurry of tweets speculating on the ingredients. We settle on peas and pickled onions, but are split on whether the topping is bread crumbs or crushed nuts. 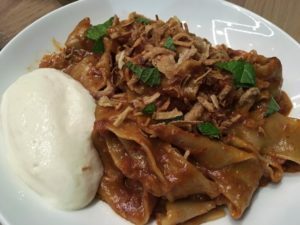 Spicy hand cut noodles with fried shallots and beef ragout are luxuriant. A dollop of whipped tofu offers respite from heat-inducing calabrian chili . 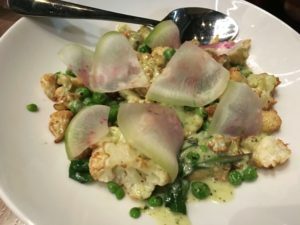 There are some appealing options for vegetarians at Momofuku CCDC including cauliflower accented with ramps, peas, radish, and jalapeno. The heat in the dishes here are not distracting or overpowering; it’s just enough to be scintillating. David Chang cares deeply about ramen. We don’t want pork, not because we’re all Jewish, but because a few of us want to give Momofuku beef noodle soup a try. The soup is heavy on brisket and pepper, evoking more of a Jewish flavor. We’ve veered away from classical ramen and landed smack into our own tradition. David Chang puts Momofuku CCDC in the capable hands of Executive Chef Patrick Curran. Curran has been with Momofuku Noodle Bar in New York since 2010, moving to DC to open the City Center location. Curran is currently a semifinalist for Eater Young Guns 2016, which recognizes talented chefs nationwide. 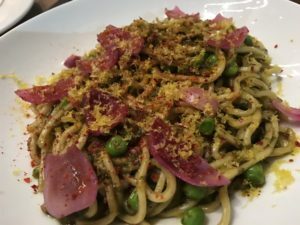 Momofuku CCDC is not the best choice for the spice-adverse diner, but there is an effective way to cool down from boldly seasoned dishes. Milk Bar is right next door, and you don’t have to leave your table to order the desserts. Owner Christina Tosi founded Milk Bar as a spin-off of Momofuku. Her most famous creations are cereal milk ice cream, compost cookies, and crack pie. I am a skeptic, having tried each of these desserts in New York and not quite feeling the wow factor. The cereal milk ice cream particularly leaves me cold. 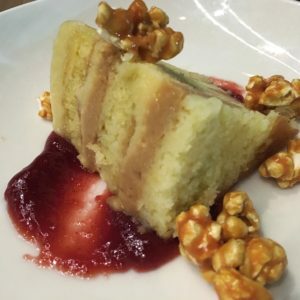 But holy cow…popcorn cake with caramel corn and pickled raspberry jam is perfection. The thought of that creamy/crunchy cake with its confluence of buttery, salty, and tangy flavors makes me want to hop in my car this very minute. There’s more to discover at Momofuku CCDC. The Bo Ssäm (ssäm is Korean for enclosed or wrapped) caters to a group of 4-8 people and features a slow cooked pork shoulder. You can also bring a group to indulge in a fried chicken feast, which includes Korean and Southern fried chicken. Momofuku CCDC opened as a hot restaurant based on David Chang’s food world fame. It needs to deliver on more than name recognition in order to stay hot. Judging from the crowded restaurant, the enthusiastic service, and the skillfully prepared food…so far, so good.